Although the two games – Poker and Slots – have for the longest time been mutually exclusive, the rise of Poker Slots has increased as more and more as casinos have taken to heart the ease, accessibility, and automatic qualities that a machine-based Poker game can provide. One of the reasons that Poker and Slots have existed as disparate games – in the past you could probably expect to see them at opposite ends of a casino – has a lot to do with the style of gambling that each relies on. Slots have always been completely ‘up to chance’ – you turn a crank or push a button and a random outcome will determine if you win or not. There is literally no skill involved. Poker on the other hand, for anyone even remotely acquainted with the game, is strategy dependent and incorporates the elements not only of luck but skill and psychology. The inherent differences between Slots and Poker is also, ironically, what allows the two to exist so harmoniously when merged together into a single game. Poker Slots combines the randomness of Slots by utilizing RNG (Random Number Generator) software to produce rows and columns which display cards. Based on the flip of the cards, certain combinations allow the player to enter a second part of the game that employs the gameplay of Poker. A certain number of credits are bet, and then a five-card hand is displayed, allowing players to Hold or Discard any number of them and then make another flip, which will be the final hand. 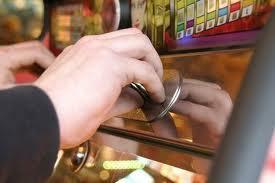 Most machines in casinos will function according to five-card draw and use Jacks or Better rules. With even a simple grasp of Poker tactics and an ability to accurately play off of winning hands, a player can expect an extremely reasonable return, up to 99.5% over a long enough game. One might wonder why casinos would offer a game that has such a high return and easy payout – for one, most players won’t have utilize a well-thought strategy, and because it’s ‘slot-oriented’ there is a psychological tendency to rush through, and it’s this combination of weak players and expected errors in gameplay that account for a casino’s profit. So how does one beat the odds at Poker Slots? First, by knowing all the hands and then knowing what the payout is on each along with the expected probability of that hand turning up. The highest hands are a Royal Flush (A-K-Q-J-10 of the same suit), Straight Flush (five consecutive cards of same suit), Four of a Kind, Full House (three cards of one rank, two of another rank), and a Flush (five cards of same suit). You will find that most games are classified as a 9-6, meaning that there’s a 9 to 1 payoff for a Royal Flush and a 6 to 1 payoff for a Flush. Second, knowing which hands to keep (Hold) and which to throw away will also increase your chances of winning, and this strategy subscribes to any basic Poker game. The transferability of skills allows a seasoned Poker player to easily out-maneuver a Poker Slot machine. In keeping with the popularity of both games, it’s no surprise that many casinos (both in real life and online) have devoted more and more resources to developing and increasing the access players have to Poker Slots.